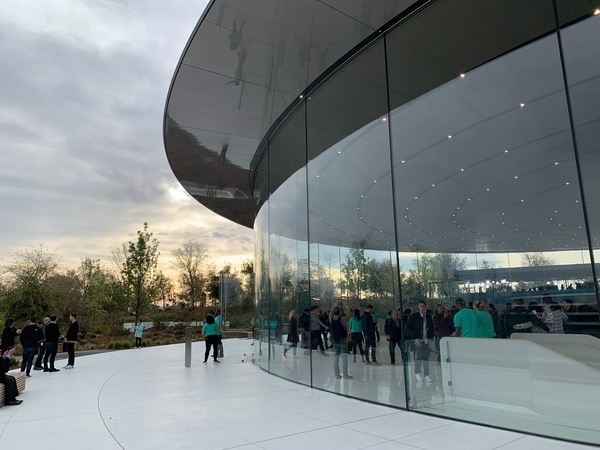 Join us as we join Apple in Cuptertino for its first media event of 2019, widely expected to serve as the launch pad for the company's video subscription service, news subscription service, and possibly more. 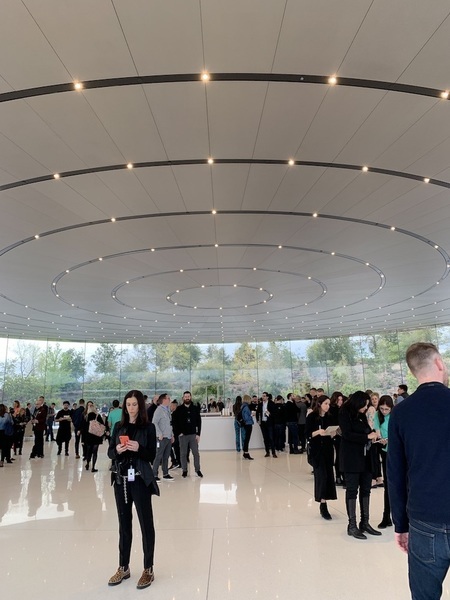 We're at Apple Park outside the Steve Jobs theater, and getting ready for the event. 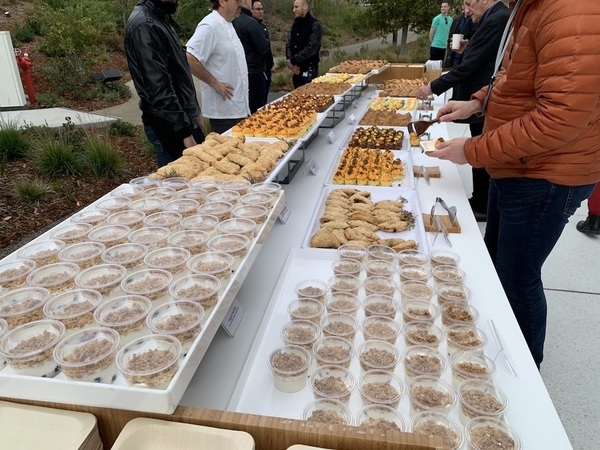 Apple is so thoughtful - there's coffee and breakfast, too. 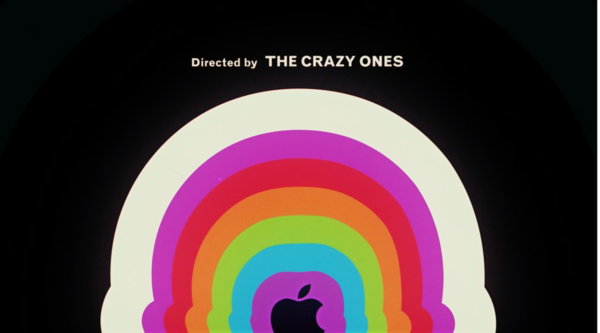 Good morning, and welcome to the Steve Jobs theater. As you can tell, today's going to be a really different kind of event. ... For decades we've been creating world world class hardware and world class software. Today is about services. At Apple, our services help customers get the most out of their products and enrich their lives. Tim's talking about iCloud Photo Library as one of the benefits of integration with hardware, software and services. 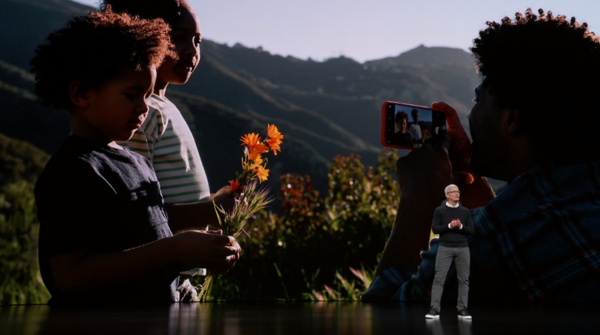 "This is something Apple does better than anyone else." We have a whole range of services, like iCloud, which keeps your contacts, calendars, Notes, and documents up to date across all your devices. Siri. Apple Maps, the most used navigation app on iOS by far. Apple Pay. and Communication services like Messages and FaceTime. Services that help you locate your iPhone with Find My iPhone or just see that your kids made it to school using Find My Friends. Most of these services are free, and some of them are pay, offering very valuable content from talented creatives, storytellers and artists. They have to be Easy to use, have Attention to detail, and keep your information Private and Secure. They're curated by our expert editors, and personalized just for you, and designed to be shared with your entire family. Today, we're delighted to expand our services to make them more entertaining, and even more informative. News is hand-picked by trusted editors. Apple News prioritizes a news source's reputation and the value of its content. It's critical that it be trusted. Apple News is the number one news app. Apple News has become an essential daily news destination for millions of people. We love the feeling of being at a newstand, being able to browse all the publications. Magazines are iconic, a part of our culture. They entertain. They educate us about the world we live in. They provide insights into science and technology. They feature the work of some of the world's best journalists. The video shows a number of journalists (photographers and writers) talking about the journalism and the point of having a trusted place to find them. 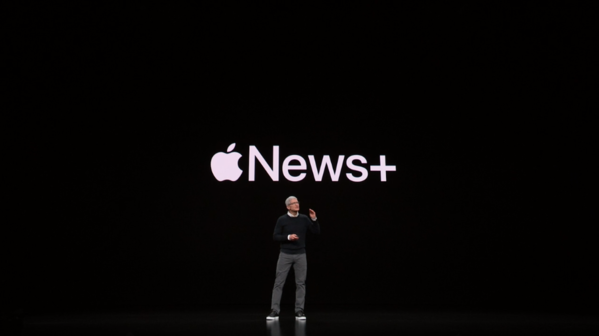 Roger Rosner, VP of applications comes up to talk about Apple News+. "We wanted to create the best reading experience ever on a mobile device." 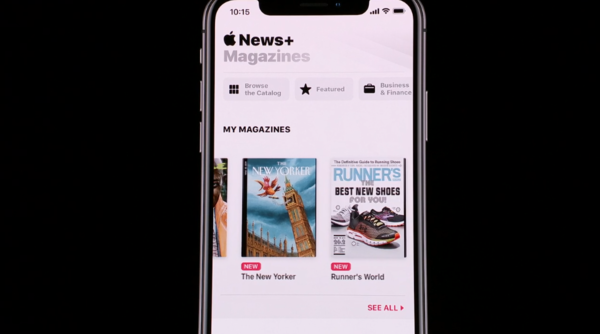 Apple News+ will bring over 3000, whoops, over 300 (Rosner corrects himself) magazines. Magazines for foodies, magazines for gearheads, magazines for everyone under the sun. And Apple News+ is the only place where you'll find all of these." 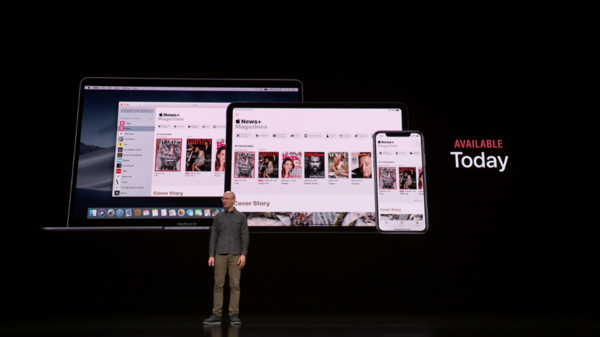 Rosner brings up Wyatt Mitchell, director of application design, to demonstrate Apple News+. He's wearing a white overall with the pants legs rolled up. We notice it, because the first story he showed was an astronaut in a space suit. "Apple News + makes the experience of diving into an issue fun. It's like having National Geographic designed for my phone." "There are more recommendations for articles and issues on the Today tab, but I can browse them all under the Magazines tab. I'll also see suggestions like Popular Science, that are relevant to my interests." 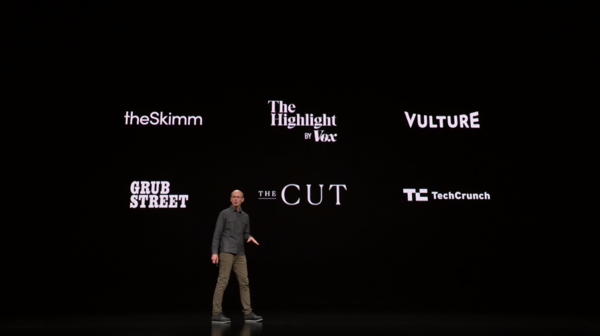 "Everything here is curated by the Apple News editors, which makes it really easy to discover a great article or magazine." And it works similarly on the iPad. The iPad looks amazing, especially for viewing photography. No one has ever made digital magazines as beautiful as this. But Apple News+ is about more than magazines. It includes the most popular digital premium prescriptions, like the Skimm. But we didn't stop there. It also includes the country's largest daily newspaper and a rising star, the LA Times. And I'm also proud to tell you that it includes the Wall Street Journal. 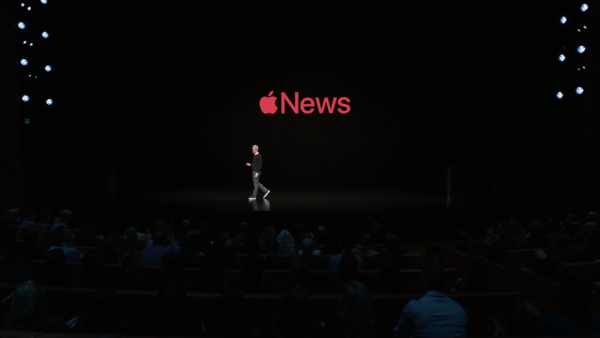 And it's personalized, so finding incredible content is just as simple as launching Apple News. Apple does not allow advertisers to track you. What you read about in Apple News will not follow you across the web. 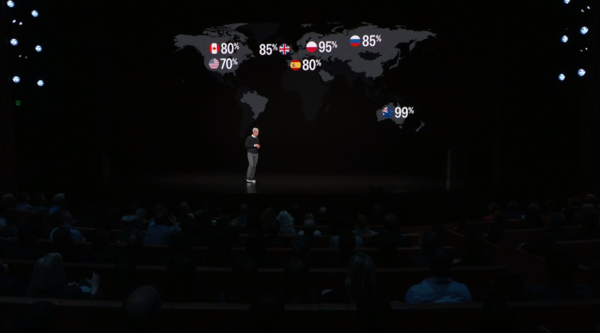 Apple News+ is $9.99 a month. And it's available not just to you, but to your entire family at no extra charge. Each person in your family gets full access to the catalog with their own devices, their own recommendations, and their own personalization. The first month is free. Launching today, in America and Canada, with content for Canada including the Star. Later this year, coming to Australia and the UK. Tim is back. 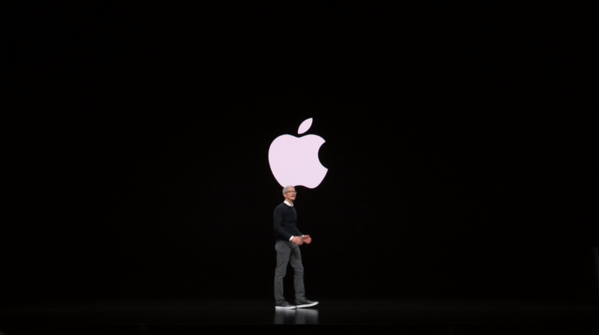 "We think Apple News is going to be great for publishers and great for customers." Apple Pay: We launched Apple Pay with a mission to replace the wallet. Growth has been off the charts. On track to pass 10 Billion transactions this year. "We're looking forward to a future where all transactions happen this way." 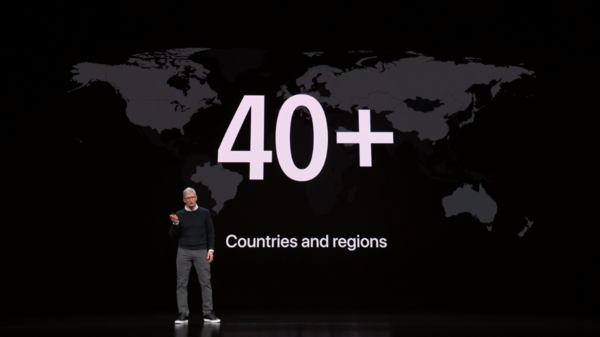 By the end of this year, Apple Pay will be accepted in more than 40 countries. Apple Pay is coming to transit in Portland, Chicago, and New York city. How can this all be better? We're going to do all of this and change the entire credit card experience. 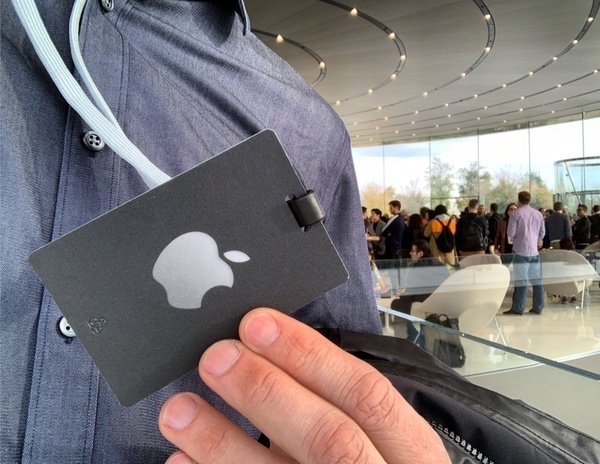 Today, we're introducing Card. Tim brings up Jennifer Bailey, VP of Apple Pay.